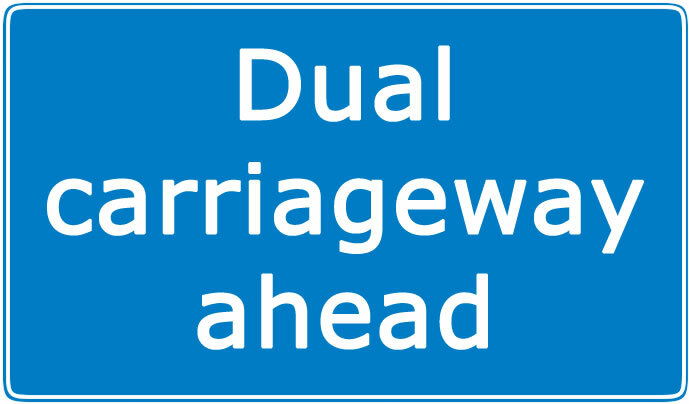 Dual carriageway definition is at least one lane of traffic (usually two or more traveling in the same direction) which is divided by a central reservation and barrier that separates the other carriageway travelling in the opposite direction. 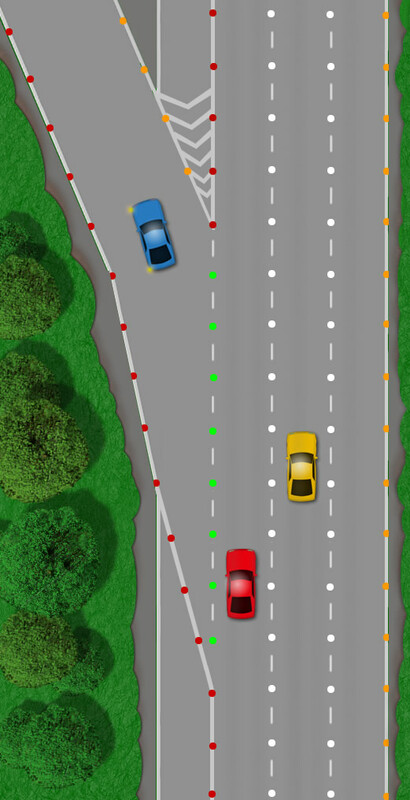 This tutorial explains the correct procedure for joining, driving and exiting dual carriageways plus other tips and advice for both learner driver and experienced drivers. Many driving test centres are situated on the edge of towns and cities. They are located in such areas so to provide as much diverse road types during a driving test as possible. Included in these road types are often dual carriageways. Dual carriageways can be challenging for both experienced drivers and learner driver taking the driving test. This is often due to the high speeds involved along with the all-important observations. Finding a good driving instructor who is experienced in the area will have an excellent knowledge of the driving test routes, including the dual carriageways and roundabouts leading to them. These areas of the test routes can be difficult so becoming proficient in them will be of benefit. You will join a dual carriageway from a slip road leading off either a road or roundabout. The speed at which you join the slip road varies depending on the circumstances. It is important to gain sufficient speed to equal those already on the carriageway. Joining the carriageway at 40 mph whilst traffic already on the carriageway is at a speed of 70 mph can be highly dangerous. Traffic isn’t always travelling at 70 mph however. Observe traffic on the carriageway at the earliest opportunity. This can be from the road or roundabout or even from a bridge that crosses over the carriageway before you join. This will provide you with a good sense at which the speed you will need to reach before joining. Traffic especially during rush hour can be slow or even stationary as you join a dual carriageway. Be prepared to stop just before the junction line if necessary. The key to joining a dual carriageway is to accelerate down the slip road to match the speed of those already on the carriageway. Whilst accelerating, make quick checks to the right and alternate with the direction you are traveling. Briskly keep checking between the two. Although the main focus should be in the direction you are traveling, brisk and frequent looks to the right is important. As you are accelerating, mark your entrance point. This could be between 2 lorries for instance, but as tense moment as this may be, be confident and focus on your marked entrance point. 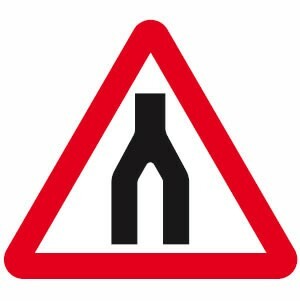 This may require accelerating or slowing to safely enter the carriageway. Check the interior and right mirror and signal to the right. Remember, observations should have started way back at the earliest point, so the position will depend on where you intend to join in relation to your speed. Speed is dependent on the traffic on the carriageway and as you join you will need to look in your interior mirror to ensure traffic isn’t too close behind you. It is acceptable to join the carriageway a little too close to a vehicle in front of you that was already on the carriageway. If the gap you joined was a little small, this can be unavoidable. However, if this is the case, you must increase the distance between you and the vehicle in front. This can be done by either very gently slowing down (doing this too quickly is dangerous to vehicles behind) or better still is to overtake the vehicle if safe to do so and if keeping within the 70 mph speed limit. Joining a dual carriageway is the most difficult part for most learner drivers. Providing you match the speed of the traffic on the carriageway, mark your joining place at the earliest opportunity, stick confidently with your joining place by use of accelerating or slowing, then with plenty of practice it becomes easy. The faster you travel in a car, the less turning of the steering wheel is needed. When altering direction on a dual carriageway at 70 mph, steer the wheel slightly and gently. Although the slip road used to allow traffic to join a dual carriageway is often long enough to allow a vehicle to accelerate to a speed to match those already on the carriageway, occasionally there are short slip roads. If the dual carriageway is busy, it may be necessary to wait at the start of the slip road for a suitable gap to accelerate into. Once on the carriageway, stay in the left lane until you have had a chance to adjust to the situation and remember to keep a safe distance from vehicles in front. The 2 second rule may help with this. The speed limit of dual carriageways is 70 mph. The examiner will be expecting you to drive at the 70 mph national speed limit if it is safe to do so. If you are behind a slow moving vehicle, overtake if possible. Look well ahead as well as your immediate surroundings on dual carriageways. Traffic that has stopped or reduced speed ahead can be dangerous for fast approaching traffic. Mirrors – check the interior and right mirror. Look for vehicles that may be approaching at speed from behind to overtake you. If you are confident it is safe to overtake, briefly check the right side blind spot. 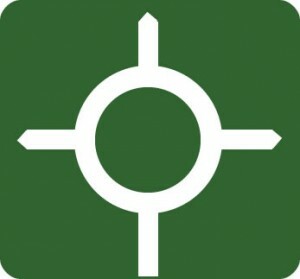 Signal – apply a signal to the right. Position – keep a good distance behind the vehicle you intend on overtaking by using the 2 second rule. If driving too close to the vehicle in front, the driver may not clearly see your intention to overtake. Speed – gently steer to the right and once in the right hand lane accelerate past the vehicle. Look – once in the right lane, check the interior mirror for approaching traffic behind. Wait for the front of the vehicle you have just overtaken to appear in your interior mirror, then check your left mirror, signal to the left and gently move back into the left lane. The left blind spot may need to be checked if you are in doubt it is safe to move over. Dual carriageway reflective studs or cat’s eyes are designed to be most effective in poor light conditions by reflecting light. The colour of the studs always has the same placement on motorways and dual carriageways. Red – Dual carriageway reflective studs are placed along the hard shoulder of both motorways and dual carriageways. They can also be seen on the left of certain A or busy B roads. Amber – Dual carriageway studs are placed to the far right, running alongside the central reservation. 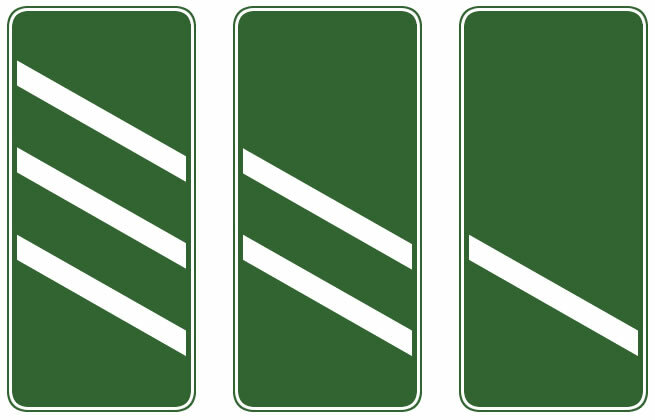 Green – Dual carriageway studs indicate where a junction either joins or leaves a Dual carriageway, called a slip road or deceleration lane. White – Dual carriageway studs are placed between the lanes of dual carriageways or motorways. Blue – Dual carriageway studs can occasionally be seen and are for the use of the emergency services. 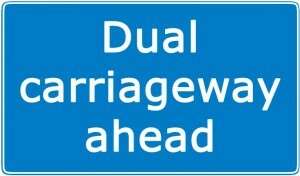 As you are driving on the dual carriageway, other vehicles may also join. Keep a eye for slip road junction ahead and other vehicles joining. You do have right-of-way over vehicles joining, however you should make their joining as safe and easy as possible. If you feel you may impede another vehicle joining, either if safe to do so by checking the interior mirror first, gently decrease speed or change into the right-hand lane by use of the MSPSL routine. Occasionally, there may be a need to turn right on a dual carriageway. If so, ensure you are in the right-hand fast lane in good time. Use the MSPSL routine for turning right. This will need to be completed in good time as you are driving at speed and will need to provide traffic behind with plenty of warning. There will be a slip road speed reduction lane to enter before the turn. Ensure you do not slow down too abruptly before you entre this lane as it can be dangerous for vehicles behind. If a vehicle is following too closely before you turn right, you may need to gently slow down a little sooner to allow them enough reaction time for you to make the turn. You are traveling at high speed, slow down gently in good time and ensure you do not leave it too late to start slowing. Dual carriageway roundabouts are often large multi-lane. The MSPSL routine needs to be applied for which ever direction you are taking. If turning left or following the road ahead at the roundabout, remain in the left lane. If turning right at the roundabout, you will need to move into the right lane in plenty of time before the roundabout. If you are unable to take the right lane due to traffic density, remain in the left lane and either turn left or follow the road ahead. Do not turn right / 3rd exit from the left lane. A vehicle may be following the road ahead (2nd exit) from the right-hand lane which can cause a collision if you turn right (3rd exit) from the left-hand lane. Further information on large and double roundabouts. During a driving test, the examiner may something along the lines of ‘I would like you to take the next exit’. You will see countdown markers. The 1st one you see will have the 3 slashes signifying 300 yards from the exit. It is at this marker you look into your interior mirror, followed by your left mirror and signal to the left. Following the 300 yard marker is the 200 yard and finally the 100 yard marker before the exit junction / deceleration lane. Remember that you may be taking the exit junction at 70mph and will need to gently slow down on the exit junction to the appropriate speed for the road or roundabout you will be joining. The following are dual carriageway rules and regulations that must be followed. The national speed limit on dual carriageways unless stated otherwise by road signs or light signals is 70 mph. Undertaking on a dual carriageway is only permitted when a vehicle is using the right lane for turning right or in situations of high traffic density, if your lane is travelling at a great speed than the fast lane. It is not illegal for a cyclist to ride on a dual carriageway unless stated otherwise by signs. It is however extremely dangerous and not advised. With the exception of parking lay-bys and service stations, drivers are not permitted to park on the hard shoulder of a dual carriageway. 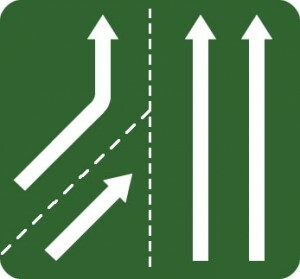 From the 2 lanes joining the carriageway, the right lane must give-way to traffic already on the carriageway and the left lane has a dedicated lane. All roundabout signs on dual carriageways are coloured green. Dual carriageways and motorways use chevron road markings on the entrance and exit slip-roads. Chevron road markings surrounded by a white broken line can be entered if safe to do so. Chevron road markings with a solid continuous white line boundary must not be entered except in an emergency. You can find the routes for Greenford (Horsenden Lane) in the driving test routes for sat nav section. Navigate to ‘G’. I struggle to read the right hand mirror and just see lots of cars travelling very fast! I cannot work out whilst driving fast on the slip road if there is a gap, have you any advice please? Yes, you need to physically look over your right shoulder at the traffic on the dual carriageway to assess their speed and to find a suitable gap. You shouldn’t rely on mirrors only because of blind spots. Don’t take too long looking over your shoulder because you should be looking where you’re going. Quickly alternate between looking over to the right and ahead and the most important thing to do is to match the speed of the cars already on the carriageway. The more you practice entering dual carriageways, the easier it gets. Thank you! So, if I am ahead of the cars and I maintain a good speed – that would be my gap? Yes. Sometimes the ‘gap’ isn’t always ideal, so if your following distance from the car in front is a little short (when you are on the carriageway), you will need to extend this to allow for a safe following distance. The 2 second rule is quite an easy way to judge this. That’s so helpful, thank you so much for your time. I was really struggling but this gives me hope! You’re welcome. Good luck for when your test day comes around.